I always go to Greenhills and it is one perfect place where you can buy lots of accessories from bags to jewelries. It is also known to be the place to buy PEARLS. However, if you want to know How to Tell Real Pearls From Fake Pearls then read this. Step 1: Rub the pearl against your teeth. You may be able to tell this way as real pearls are supposedly rough while fakes are smooth. This is not the most reliable method as you can find smooth real pearls and rough fakes. Step 2: Hold the pearl up to the sunlight or very bright indoor lighting. You can check for variations in the pearl’s color and tone. If it’s perfect in its color and tone, it’s very likely fake. Step 3: Look at the pearl through the magnifying glass. You should be able to see the ridges and irregularities of a real pearl, or the grainy smoothness of a fake. Step 4: Weigh the pearl. Real ones are usually heavier than fakes. Step 5: Test the warmth of the pearl. Resin and plastic pearls are often warm on first contact. Glass pearls take longer to warm in your hand than real ones. Step 6: Check the drill holes. Real pearls are drilled as small as possible to maintain their value, so fakes will often have larger holes. Also, the pearl surface, or nacre, will often flake off around the holes of fakes. Step 7: Check the pearl’s shape. If it’s a perfect sphere, it’s likely a fake. Ahhhh.. the financial crisis has really spread globally and even the toughest and stable nations are now experiencing a hit on their economy. All sectors are being affected and just last night I was watching the news many of our overseas workers in US and Ireland are continuously being fired from their work. A very frightening scene and we could only hope for a better tomorrow. Car manufacturers have also cut their production bec. there is low demand in the market eventhough they are giving good discounts and fare prices. Some would have even give auto insurance rates to somewhat get the people to buy but with the recession and crisis no one would even think of buying a posh new car at this moment. Second hand cars are much preferred these days I reckon. We just need to pray and be more hopeful for the coming day, I am sure that there is new light at the end of the tunnel. Went to my fave shopping place yesterday after lunch to buy some CD and DVDs. I amazed with myself bec. I didn't bought anything else aside from the CD/DVD and underwear ..lol I was really controlling myself to shop, I was about to buy a shirt but my size is not available, good for me! 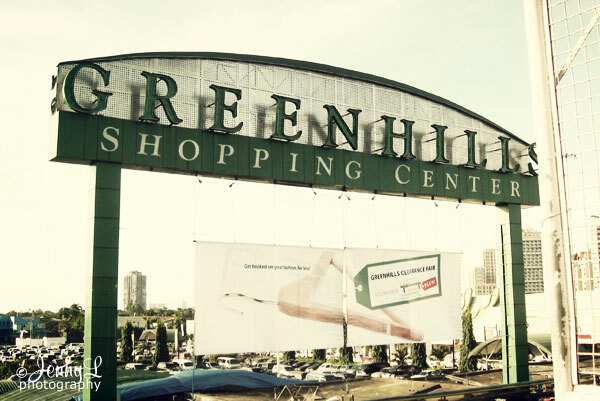 GREENHILLS is a popular place to shop for Cellphones, computers, jewelries like pearls, precious stones, export overruns, also bunch of fake items like crocs (tons of them there lol), LV and other designer bags (lots of foreigners and balikbayans shop there too), shirts/blouses and many more!! I took this photo on top of the overpass (LOL) before going home just using my canon point and shoot cam cuz i don't want to bring my DSLR. Almost everyone of us use digital cameras now and aren't they one of the greatest invention of modern technology? I just so love my own Canon DLSR that I use it every day to shoot anything. I even joined the Project 365 where you need to take a photo each day and that is very helpful i honing my skills. I often times found myself clicking to much that I got myself another CF memory card so that I will not run out of space. There are many CF, XD or sd flash memory that you can buy online at affordable prices.You can check out Memory Suppliers for your needs. I Really Need a Laptop! I guess you have read it here or at my other blogs that I really wanted to own a laptop. I am eyeing Dell or HP brands if I already saved enough this year. I wanted to own one so that I can still be online at the house when I go home at night. I am thinking that if I will not get the HP pavillion I can consider one of this HP netbooks that is quite affordable. I have yet to peruse it's specs more before I buy it. I already scouted some prices at some computers shops 2 weeks ago and this weekend I will go to Greenhills once again to compare prices of different brands. Summer is almost here (or is it here already) and this set is perfect summer get up. Love that sandals, looks so comfy, it's actually from Coach and costs &300. yay. ! The bag is from Coach and that yellow shirt is from Juicy Couture. I have been contemplating to renovate or just repaint my own room for quite sometime now. The paint is chipping already and very faded too and it's already too nasty to see it. I also wanted to have a fresh, neat and clean look for my room but my budget stops me from doing so. Saw this nice bed linens by Sferra and that definitely inspired me more. I love the warm shade of the sheets and those bright lit windows will add more elegance in it. Gosh I would really love to have a room like this one to give me more comfort, style and peace when I am going to dreamland. Anywhere we go we always aim that we are in safe and good condition. We are always at risk whether we are at work, in the streets and even in the comforts of our home. Much greater risks are those working in the construction, industrial zone that is why safety first and safety equipment are a must there. You can purchase lots of storage, handling and security products and more at Critical Tool website from safety drums, gloves to name a few. It's already known that Michelle Obama is the first lady of American fashion. All eyes are on her now especially on the clothes that she wears. Why not? She is a true fashionable, elegant and stylish on her own. She may wear designer clothes but she also wanted to wear something affordable that anyone can imitate. She is gracing the cover of VOGUE magazine on March and for sure the magazine will sell like a hotcake. She wearing a magenta silk sheath dress, which is designed by Jason Wu. Wu is also the one who designed her inaugural gown that makes head turns. Hongkong Disneyland in my mind! I guess everyone dreamed of going to Disneyland, so it's perfect that Hongkong opened one so that we Asians can go there w/o even applying for a visa. HK is just 2 hours away from us (of course by plane ride) and we are already thinking of taking a vacation there this year and we are really so excited esp. the kids. My mom too has always been dreaming to go to Hongkong in fact even if she is already 76 she still wants to travel and of course see this magical place plus I don't think she still needs to get a travel insurance to be there. Ahhh i know my nieces and nephews will have a blast and I for one will have a blast shopping (i need to save!!!) I am already looking for good deals on fare prices and hotel on my local agency and we the date that we are targetting(Dec.) we should buy tickets early bec. it's peak season and holiday. We are really praying that this will push through, with God's help. in your room can also keep you warm while going to bed. This Ribbed MicroFleece Low Voltage Heated Blanket is World's Safest Electric Blanket and is now on sale at CozyWinters.com for only $89.9. For more details and more sale check out their site.